For candidates appearing in the June 2019 Level I exam. 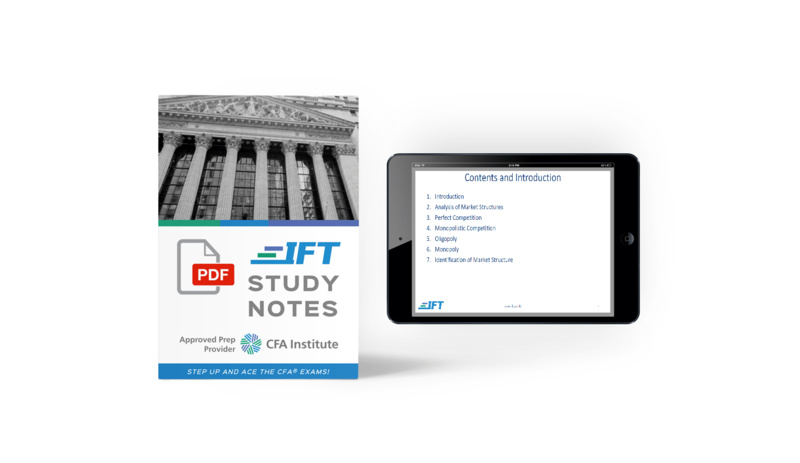 Prepare with comprehensive IFT Study Notes and Lecture Slides! An excellent complement to IFT Detailed Videos. -Detailed Study Notes covering all LOS, Examples, Practice Questions and Summaries. -Slides for all 75 hours of Level I detailed video lectures by Arif Irfanullah. These are in PDF format so you can download and print them out. As you watch the Free Level I videos, you will find these slides super handy. All materials will be accessible from the IFT Learning Portal. No items are shipped to you. IFT Study Notes are aligned with the curriculum and present the information in an easily understandable manner. The most important points of each section of the curriculum are highlighted and explained. Reading the notes helps to reinforce your understanding and grasp of concepts. Notes are provided in PDF format.